Volunteers are angels disguised in team shirts. They help set up before a game, match or meet; they help break down after; and they’re always first to offer their place for the pizza party after. We love them, and we’re sure you do too. 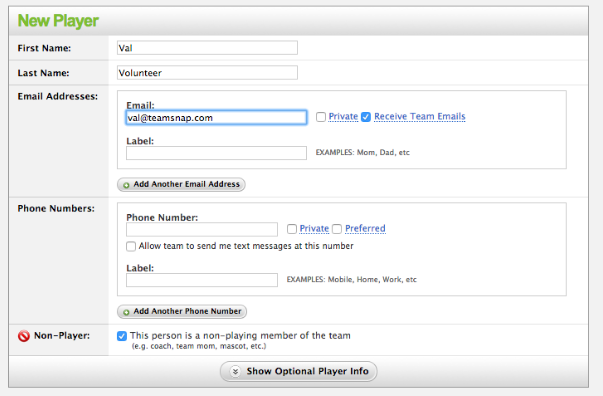 So how do you make sure volunteers are getting the information they need through TeamSnap? It’s simple! This ensures that the volunteer will receive the same schedule, messages and TeamSnap Live! updates the rest of the team does. Now, to assign volunteers specific jobs to do, simply go to the Refreshments tab. Choose which game, practice or event you want to assign a job for, choose the person’s name from a drop-down menu, then assign something to do or bring. You can put anything here! That’s it! You can customize the events and jobs you want people to do based on your needs. Everyone stays connected, everyone stays happy. That’s TeamSnap!